Julia and her friends helping lead worship. Last night at Sports Camp while riding on a “gator”, I was talking with one of the newest members of Graystone Church. He, his wife and his daughter are all serving at Sports Camp. He said, “Sports Camp is incredible. You know what we see… One big family serving God together.” Wow! He referred to Graystone as a big family, which is one of the metaphor of the church used in the Bible. Nate and some of the staff often refer to me as “Poppa Bear”. Well, I am a proud poppa. 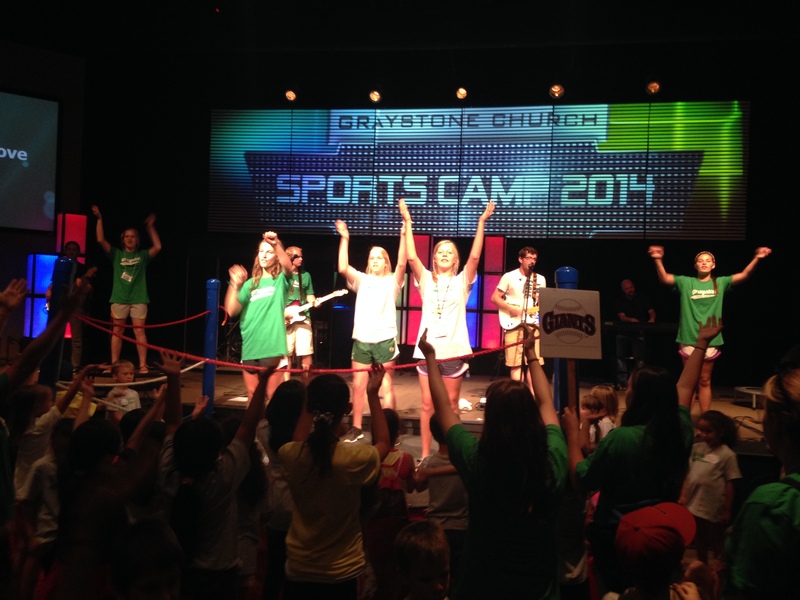 Another one of my favorite things about Sports Camp is seeing families serve God together. Husbands and wives serving together. Mom, Dad, and their kids serving God together. Fathers and sons serving God together. Moms and daughters serving God together. It is a beautiful thing. 11 years ago this July, the Howes family moved from Texas to Georgia to start Graystone Church. It has been a family affair. It’s so exciting for me to see Julia on stage helping lead worship and to see Joelan on the tennis and basketball court coaching the kids. Jennifer has always had a passion to reach kids for Christ, so she is in her element hosting the large group teaching times. Jessie, our “grandchild”, is having a blast being a camper. One day, she will have her turn to serve. I am a proud “Poppa Bear”. I am proud of my family. I am super proud of my Graystone Church family. And what really excites me is that our Heavenly Father is pleased because we are all using our time, talents and treasures to serve Him and build His kingdom. Thank you to EVERYONE who is able to serve and for being a part of our Graystone family! I love seeing men serve at Sports Camp.